The works described were carried out mainly in March, April and May 2007 with final completion through June and July. If you’ve never heard of Bollington’s Historic Triangle don’t worry! It’s the term recently applied to three streets that are the subject of a Conservation Area improvement project which has attracted a significant sum in grants. The three streets are Water Street, High Street from its junction with Fern Bank Rise to Palmerston Street, and Palmerston Street from the entrance to Tullis Russell down to the canal aqueduct. These streets are all in the Bollington Conservation Area. 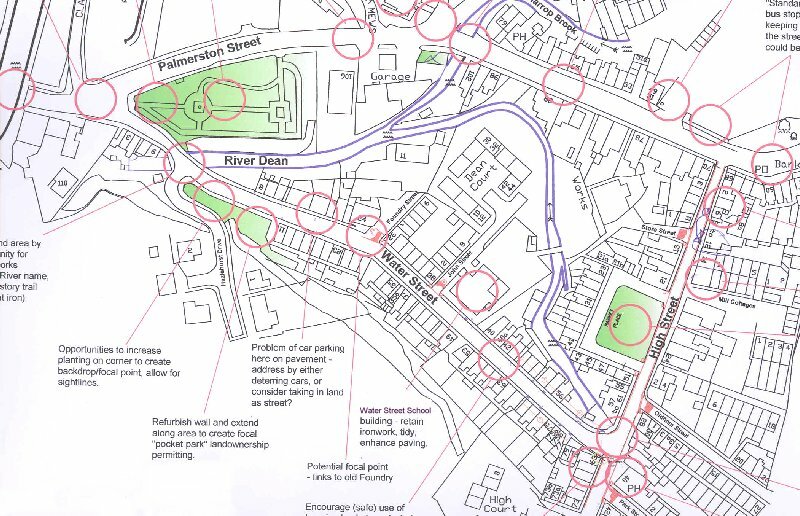 Sophie Brown, MBC landscape architect, drew up a plan showing the features of the streets that could be improved to enhance the conservation area. It was recognised that there was a need to better define the heritage areas by ensuring that one could see that one was entering the area. This was done by establishing gateways. The most obvious way in which this can be done is by road surface treatment such as colouring. Three gateways were implemented – near the aqueduct, which itself provides a very obvious gateway between West Bollington and the old town, on Palmerston Street just above the junction with High Street, and in High Street just below Fern Bank Rise. There were actually two projects, from the funding point of view. The total sum involved on the Historic Triangle itself was £133,000 made up of £50,000 each from Macclesfield Borough Council and Cheshire County Council and £33,000 from the ReVitalise Fund of the North West Development Agency (NWDA). The Borough Council offered its contribution following publication of the Bollington Parish Plan and the County Council Highways Department then agreed to seek funding to match this from the South East Manchester Multi Modal Study (SEMMMS) pocket. Bollington Town Council decided that the priority should be upgrading of the conservation area including High Street and Water Street. The NWDA money was obtained through a bid by the Parish Plan Implementation Group to complete the third leg of the triangle by improvements to Palmerston Street, and that money has to be spent on Palmerston Street. The second project is concerned with improvements to signs, litter bins and a tourist map with a total budget of £24,100, of which £10,000 comes from a contribution by Cheshire County Council towards implementation of the Parish Plan, £10,000 from the NWDA ReVitalise Fund and the remainder from contributions from the Borough and County Councils. The total for both projects is £157,100. A project team consisting of the Highways Committee of Bollington Town Council (BTC), the Parish Plan Implementation Group, who were responsible for putting together the bids to NWDA, and the Civic Society (BCS) supported by planning, conservation and highway officers from Cheshire County Council (CCC) and Macclesfield Borough Council (MBC) met regularly from the start of 2006 to draw together the financial and practical possibilities. The team walked the streets in February to identify the problems, the possibilities and the opportunities. They got a feel for the area and recognised its importance in the Conservation Area (CA). The team was joined by Peter Neville, who lived in High Street, as a residents’ representative. Peter Yates, MBC Chief Planning Officer, chaired the inaugural meeting of the project in January 2006 and expressed his full support. He enhanced this support by providing, outside the project budget, the services of his conservation landscape architect, Sophie Brown, to draw up a proposal for the enhancement scheme. Her proposals were discussed at a meeting on 26 July 2006. Only use yellow lines where they absolutely have to be used and then in the narrow primrose format. Enhance the iron fencing round the Water Street Centre and the gateway. 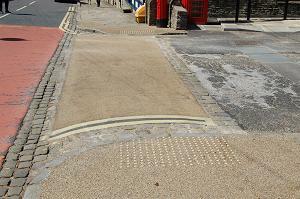 Only use yellow lines where they absolutely have to be used and then in the narrow format and primrose colour. Consider with the residents’ improvements to the Green. This is the most important heritage feature in the street and requires very sensitive attention. Provide a conservation area ‘gateway’ near the aqueduct – actually installed near the bus shelter. Better use the area of roadway at the junction of Beeston Brow, Queen Street and Palmerston Street. It is pleasing that one of the most unsightly items in the original plan has been implemented in a much better way than proposed. 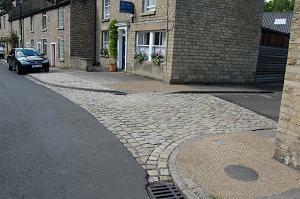 Every drop-kerb crossing is required to have a tactile surface and this is usually provided by brightly contrasting coloured tiles with bobbles on them entirely out of keeping with the conservation area. Instead a satisfactory result has been obtained by the use of suitably coloured surfacing with studs set in the surface at the crossing point.